Freelance public speaking coaches are individuals who help others with their presentation and public speaking skills. This type of freelance work is not for everyone, as a proven track record of successful speeches and presentations is usually necessary to convince clients that the coach is worth hiring. This means that becoming a freelance public speaking coach may be a good fit for individuals with a background in business and sales, the performing arts or training in working with and coaching others. A freelance public speaking coach does more than just act as a voice coach. While such a coach will help clients learn to care for their voices, and project and nuance their voices for their audiences and subject matter, (s)he will also do much more to make clients comfortable with speaking in public. 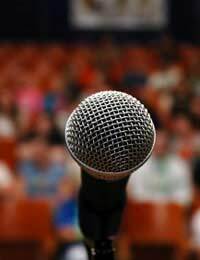 A freelance public speaking coach may also help clients past shyness, learn how to deal with fear before a speaking engagements, think about their pacing and breathing while they speak, incorporate props or visual aids into their presentations, connect with the audience through anecdotes, jokes and eye contact and prepare for questions and/or interruptions. Usually this is done through one-on-one appointments with a client and intensive practice of speaking in public. Freelance public speaking, unlike some other types of freelance work, lends itself very well to working with companies and larger organisations. Targeting these markets by sending out letters of introduction and information packs may result in getting a contract with the organisation to help train its employees in public speaking and presentation skills. This type of work also lends itself well to working with individuals who are proactive about improving themselves, as well as students who want to prepare for academic or employment interviews. This means that freelance public speaking coaches may do well to advertise in the general community to attract individual clients, or through colleges and universities who may be interested in bringing them in to teach special classes, workshops or lectures for groups of students. Freelance public speaking coaching is work that is usually best done face-to-face with clients. This is because the coach needs to be able to watch the entire “performance” that is delivered by a given client, not just to hear the way the client delivers his or her speech. Coaches will help clients with body language and image, alert them to any tics or nervous habits that they may have and give them a general review of their entire delivery. This means that sessions may often be held in a private home or office, or at the clients’ premises (if the client is an organisation or institution). It also means that some technology may help with long-distance sessions, such as a web cam or videos, but other, such as a telephone or email, will not be the best choices for holding freelance public speaking sessions. Freelance public speaking coaches help others become more comfortable with speaking in public. Individuals interested in this type of freelance work should consider their background and training, how they will find clients and where they will hold coaching sessions.